With classic, clean lines and a signature low profile that provides unmatched safety and stability, and cutting-edge systems that allow effortless cruising for a husband-and-wife crew, the Fleming has established itself as the finest yacht in its class. From its solid fiberglass laminate hull and duplicate essential systems, to its elegantly appointed salon, staterooms and flybridge, each facet of the Fleming has been carefully considered and expertly crafted. What makes the Ultimate Cruising Yacht? The Fleming’s semi-displacement hull design provides the ability to cruise efficiently with long range at displacement speed. It also means you can pick up the pace and cruise in the upper teens, if needed, to avoid bad weather. The fine entry forward, with generous flared bow, provides a soft entry and extremely comfortable ride. Full-length deep keels improve directional stability and protects running gear from accidental grounding which is an absolutely essential feature for any serious cruising yacht. Each hull is a solid fiberglass laminate reinforced with an interlocking matrix of frames and box-section stringers which provide strength and impact resistance that exceed the requirements of CE Category “A” Ocean class. Unlike cored hulls, which typically have a thin outer skin, the Fleming’s hull is impervious to water penetration and resistant to penetration by foreign objects. 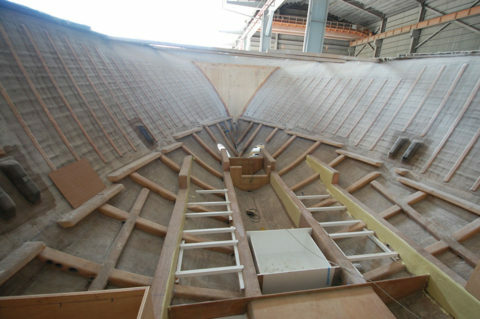 Additional reinforcement areas built into the hull include: at the stem, around the bow sections ahead of the collision bulkhead, the chines, the stabilizers and keel. Vinylester resin is used for the layup in the outer laminations; five coats of epoxy are then applied over the gelcoat below. A stainless steel shoe protects the full-length keel which extends 12” below the running gear, providing directional stability and protection from grounding. The top of the keel is sealed so that, even in the event of major damage, the integrity of the hull is not compromised. Corecell M-Foam is used exclusively for the core material in the sandwich laminates on the superstructure. Overall, the Fleming’s solid FRP hull handles majestically and predictably in all conditions; whether in a full speed hard over turn or when gliding into a berth. There is absolutely nothing “standard” about the standard systems included with each Fleming. The items detailed here are by no means the complete specifications for all Fleming models. Rather, this information offers highlights of a selection of the most important features and equipment which are included on each model. All system components are sized over and above design requirements. Essential systems are duplicated to provide backup and redundancy, and all equipment is accessible for ease of service and maintenance. Whenever possible, everything is either soft-mounted or double-soft-mounted to minimize noise and vibration. Each Fleming includes reliable twin MAN or CUMMINS common-rail diesel engines which have impressive torque curve and great power-to-weight ratio. Two are always installed for redundancy and increased maneuverability. Seatorque Shaft System: A Seatorque Shaft System which, unlike conventional shaft installations, transfers the thrust from the propellers directly to the hull allowing the use of much softer engine mounts. The shafts run inside oil-filled tubes, eliminating the need for stuffing box and cutless bearings. Quickutter rope cutters are installed ahead of the propeller. Glendinning Electronic Engine Controls: These are always installed with a back-up system. The pre-wired back-up systems, with dual power systems standard, provide an instantly-available essential safety feature. Stabilizers: ABT TRAC, active-fin stabilizers are installed at the factory. These fins and actuators are large enough that, should a reduction in speed be necessary during rough weather, they remain effective. Hydraulically-operated locking pins, which can be operated with a press of a button from the pilothouse, hold the stabilizer fins in the central position when they are not active and when the engines are not running. 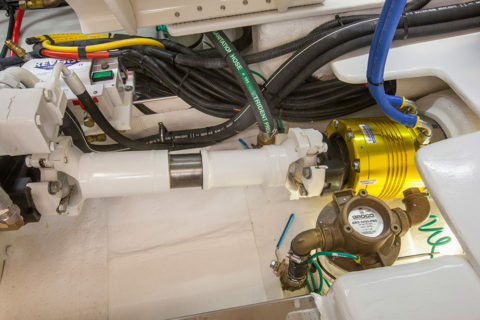 Hydraulic Systems: On Fleming models equipped with a central hydraulic system for powering bow and stern thrusters, stabilizers and dual windlasses, we install a clutch on the Power Take-Off (PTO), which allow the hydraulic pumps to be disengaged from the transmissions at the push of a button. Without the clutch, an essential safety feature, the only way to fix a hydraulic leak or problem with one of the pumps would be to shut down both main engines. Noise suppressors are installed to keep the system quiet, and systems are sized to ensure that both bow and stern thrusters can be used simultaneously. Bowthruster: A bowthruster is standard equipment on every Fleming. For the 55, 58 and 65, the standard thrusters are 15hp powered electrically at 24 volts DC. On the Fleming 78, the bow thruster is 60hp and powered hydraulically. 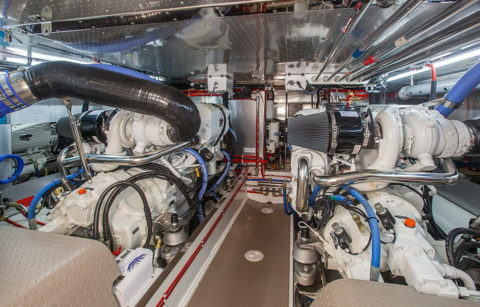 Oil Change System: Each Fleming includes two lube oil pumps, one for port engine, gear and genset, and one for starboard engine, gear and genset, to simplify plumbing and provide redundancy. Steering: On boats requiring power steering we install the Hypro fly-by-wire system. Steering wheel helm units at pilothouse and flybridge are connected to individual inputs on the electronics module in the lazarette, which controls the primary steering pump. This operates on demand running only when the wheel is turned. If both helm units, or the primary pump or its power supply fail, the press of a button engages the backup steering. This isolates the power supply to the primary pump and helm units, and powers up the back-up rudder angle indicator and back-up pump. This pump is controlled by a port/stbd toggle switch located on the back-up steering pump control panel. The back-up pump and its control circuit use a dedicated power supply from a different battery bank of the primary pump. Should the back-up pump fail, the yacht can still be steered using the autopilot which has a dedicated third pump. Finally, there is an override button on the power pack, which can be used to force the primary pump to run continuously. This allows you to manually operate the port/ stbd solenoids to move the rudders. Filters: Because thorough filtration is the key to engine reliability, each Fleming is equipped with dual Racor filters with water-in-fuel sensors all of which are easily accessible with quick changeover. Fuel Tanks: We manufacture our own fiberglass fuel tanks which include integral sumps and removable access plates to allow cleaning and inspection. Tanks are built over male molds to provide a smooth interior finish. Although constructed using fire retardant resin, outer surfaces are further treated with a fireproof coating. Our fuel tanks have been fire tested and certified by an independent testing laboratory, and are pressure tested prior to installation. Tank vents are oversized to prevent blow-back when refueling. All fuel tanks have sight glasses, in addition to electronic level indication on the central monitoring systems which uses externally mounted pressure type level sensors, and remote fuel valve shut-offs. 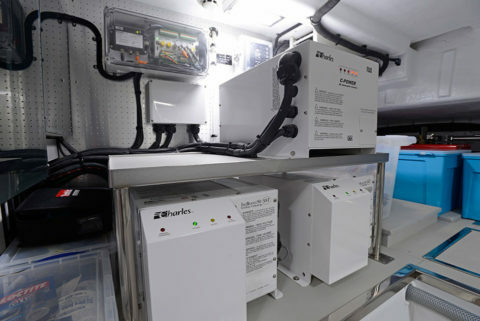 Lifeline AGM Batteries: Fleming Yachts uses only Lifeline AGM batteries on its yachts, and they are monitored from the moment they arrive at the factory. All batteries are load tested, re-charged and logged before installation in the yachts. If batteries are in storage for more than 60 days they are recharged again. This quality-assurance process ensures that all batteries are in 100% new condition before each completed yacht leaves the yard. Remote Switching & Low-Voltage Switching: This recent innovation greatly reduces the length of cabling saving weight and complexity as well as providing more convenience for the operator. Many new Flemings have the ability to switch items on and off remotely from an iPad or conveniently-located touch screens. Isolation & Boosting Transformers: Isolation transformers, which include voltage-boosting and soft-start features, have been standard equipment on all Flemings for many years. Soft-start greatly reduces the in-rush current which can cause nuisance tripping of shore power breakers. The automatic voltage boosting feature monitors incoming voltage and, when sensed to be too low, boosts it to the correct level. This feature is increasingly necessary as voltage in many marinas is frequently low and unusable. Freshwater Pumps: Because a faulty freshwater pump can be a major inconvenience, especially on a lengthy cruise, all Fleming Yachts are equipped with two pumps for redundancy. Freshwater Tanks: These are seamlessly roto-molded in the USA from corrosion-free polyethylene and include sight glasses in addition to the electronic level indication on the central monitoring system. The domestic hot water is heated by the port main engine, via a heat exchanger which minimizes the risk of damage to the engine. Black Water Holding Tank: This is manufactured of fiberglass over male molds to provide a smooth inside surface. 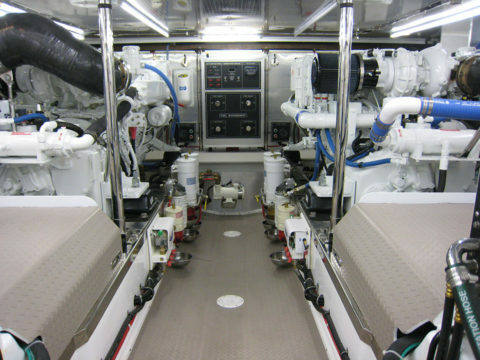 It is fitted with dual vents equipped with charcoal filters, and suction deck fittings port and starboard to avoid having to drag hoses or turn the yacht around for pump-out. Steelhead Davits: All Fleming Yachts are equipped with a Steelhead crane powered by its own 24vdc hydraulic power pack. Its fully-hydraulic lift, boom extend/retract, luff and rotate are controlled under load with a hand-held remote making it easy and safe to launch and retrieve the tender. The hoist line is Dyneema super-strength rope rather than wire cable. Ultra Anchors: Each Fleming Yacht is supplied with a stainless steel Ultra Anchor with a hand-polished finish. This handsome anchor’s unique design makes it one of the best we’ve used. 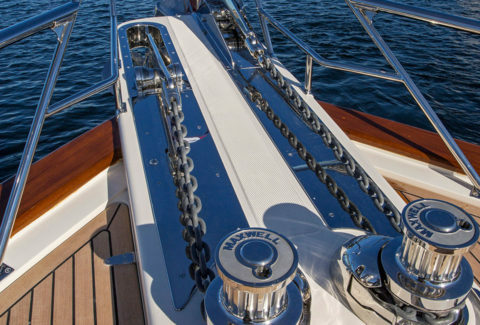 Each is equipped with an Ultra Flip Swivel, which ensures the anchor comes up the right way, and the Ultra bridle including an Ultra chain hook and snubbers. Windlass & Horn: Twin Maxwell windlasses are included as are twin Kahlenburg horns. Stainless Steel Fittings: All are 316 grade; welds are ground and polished. A Fleming Yacht is the ultimate pairing of form and function. Outfitted with the very latest operating systems, a Fleming’s technology is matchless. Designed with classic lines and sophisticated style, a Fleming offers understated luxury for the serious yachting family. A hallmark of the Fleming design is its low profile which gives the yachts their signature look as well as providing safe and effortless boarding. While with the majority of boats it is only possible to step on or off the boat from the swim step, which usually means the boat must be backed into the slip, a Fleming, includes bulwark doors on either side of the boat from the generously-sized side decks as well as from the higher-level pilothouse deck. The side decks on every model of Fleming are at a convenient height so no boarding steps are needed. They are also at the appropriate height for boarding the tender, which is launched into the water by the crane right alongside the side-deck door. Wide, protected side decks with a Portuguese bridge to ensure safe deck access all around and in all weather. An aft cockpit deck which provides a spacious area to relax and dine or cast a line. 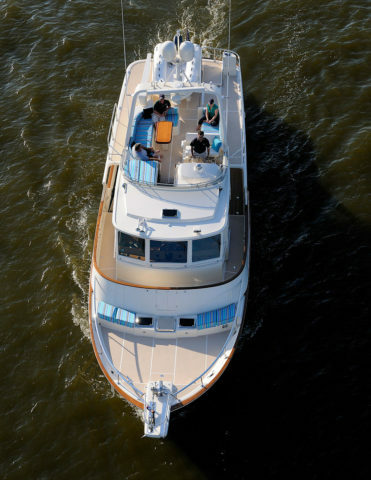 A flybridge with a full-size helm station, which allows cruising with a view, comfortable seating for dining and other amenities, and a full-sized boat deck for stowing tender and watercraft. An optional hardtop is also available. Burrwood Cap rails, which are unique to Fleming Yachts; a composite cap rail that looks like varnished teak but never needs varnishing. Stidd luxury admiral helm seat captain’s chair with footrest and drinks holder. Teak decks, vacuum-bagged, hand-laid 5/8” finished thickness. Fleming Yachts are renowned for peaceful, quiet and vibration-free cruising. 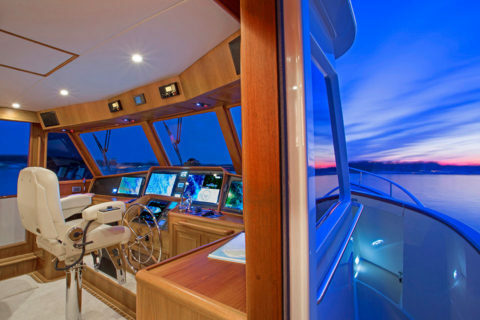 A dedicated, full-beam pilothouse offers excellent visibility, access to port and starboard side decks, and console space for the most comprehensive navigation packages available. Gentle, short staircases and numerous hand holds and rails make it safe and easy to transition to each part of the boat while at sea. Cabin soles are individually-laid 1/4” teak and holly throughout. 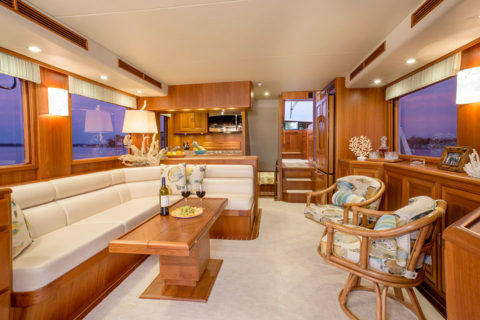 The open-plan galley and salon provide an inviting environment for relaxing or socializing. Full-sized appliances of the highest quality and a thoughtful layout in the galley are designed with the gourmet cook in mind. We also offer semi-custom salon layouts to suit individual requirements. Accommodations include beautifully-appointed cabins and heads with layout options to suit everything from a cruising couple to a family of 10. Fleming Yachts provide ample storage featuring cabinetry that is built into the yacht, rather than modular in design, which ensures structural integrity and a fit and finish that will last a lifetime.